Made of durable canvas material with anti-water repellent feature. Fit for containing 2 cameras, 2 lenses and 1flash, or organizing your items freely according to your own dividing by velcro. With three additional cases for Tablet PC, magazines, battery box or power adapter, etc. Dimension (outer): approx. 35 x 14 x 25 cm/13.8×5.5×9.8″. Dimension (inner): approx. 30 x 12 x 20 cm/ 11.8×4.7×7.9″. Color: Green. Weight: approx. 750g. 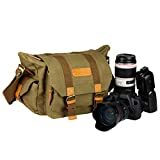 This casual digital camera bag is specially designed for photography enthusiasts to carry the cameras and accessories for outdoor shooting. The fashionable appearance and the practical inner case can provide you much convenience, and allow you to capture more unforgettable images. The inner case is designed with 2pcs of Velcro pads for freely dividing. Fit for containing 2 cameras, 2 lenses and 1flash, or organizing your items according to your own dividing. The adjustable shoulder strap fits for any figures. Dimension (outer): approx. 35 x 14 x 25 cm/13.8×5.5×9.8″. Dimension (inner): approx. 30 x 12 x 20 cm/ 11.8×4.7×7.9″. Portable, durable and fine workmanship. SLR, DSLR or Mirrorless digital cameras. Canon 700D, 70D,5D Mark II, 6D,7D,7D Mark II, etc. Nikon D800, D90, D7100, D5100, D3000, D610, etc. This entry was posted in Discount Photography and tagged 1xFlash, 2xCamera, 2xLens, Camera, Canvas, Case, Color, Digital, DSLR, Fits, Green, Mirrorless, Photography, Portable, Shoulder, TARION by Ball Photo. Bookmark the permalink.